The Inertia mesh back task chair from Allseating was designed to deliver an unmatched level of ergonomic support and comfort. This chair features a ventilating mesh backrest with deep contours, and a heavily padded and contoured waterfall edge seat to provide enhanced comfort throughout the day. 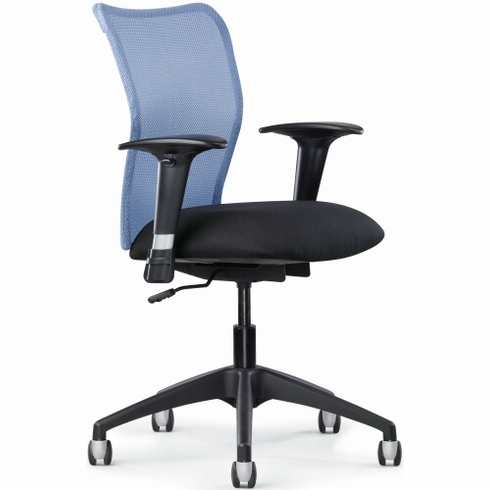 The chair offers pneumatic height adjustment of the seat, tilt adjustments with a lock and tension adjustments, and wide task arms that can be adjusted for height and width. The chair is supported by a heavy-duty nylon base on carpet casters with dual wheels to provide comfort and support for up to 325 pounds. The chair comes with a ten-year warranty, your choice of upholstery and colors, with options for different casters.